A commenter wanted to see some of the trash so I took some extra shots. I’ll try to do that again. I’m just pressed for time at lunch. 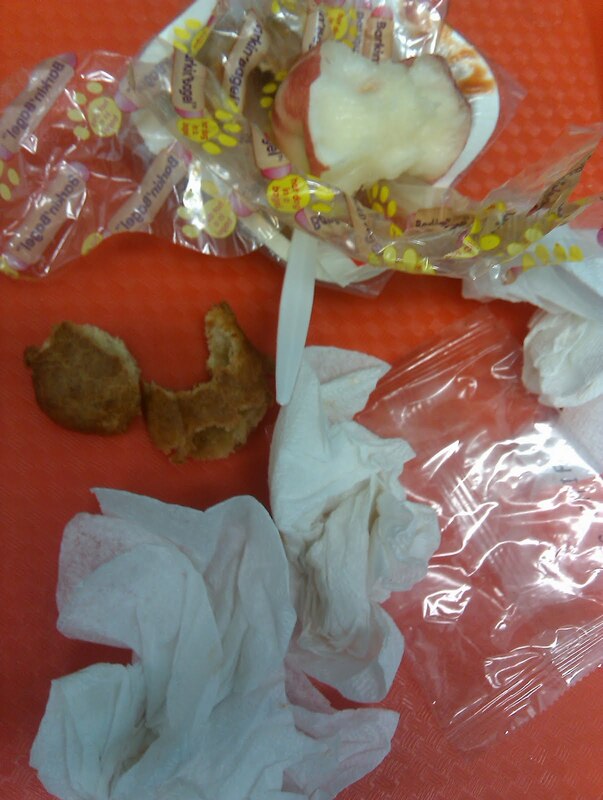 Today there wasn’t as much trash as usual because the bagel dog was in a plastic wrapper versus a little container. The packaging is really part of the story. It’s just crazy to me how the packaging is cheaper than real plates and a commercial dishwasher. Of course there is a significant expense upfront, but doesn’t that dollar-cost-average out? I think that’s a peach that I ate. I thought maybe it was a nectarine, but looking around online (I found out that there isn’t much difference between a nectarine and a peach genetically) I believe it was a peach. Of course I know you guys will correct me if I’m wrong. Whatever it was, it was good! Bring on new fruit! An anonymous commenter mentioned he/she was “consistently disappointed by [my] lack of hard critique” of what I eat every day. Well. It is what it is. I’m not sure what else I can say. Should I be hopping mad day after day? I’m 96 meals into this. I’m a little fatigued. Me and a rib-b-que in an interrogation room Law-and-Order-style. At a steel table, I am staring down a processed beef patty aka Mr. Rib-b-que. titanium spork gleams from side of the padded room. Mrs. Q, dubious: “Likely story –” Mrs. Q grabs Mr. Rib-b-que and hurls him against the wall. Mrs. Q’s heels click as she walks towards the door and slams it. Mr. Rib-b-que is a mess on the floor. Ha! The Rib-b-que Law and Order style is priceless! Love it! As for the meal… it can't be very healthy, but it definitely doesn't look as bad as some you've posted. 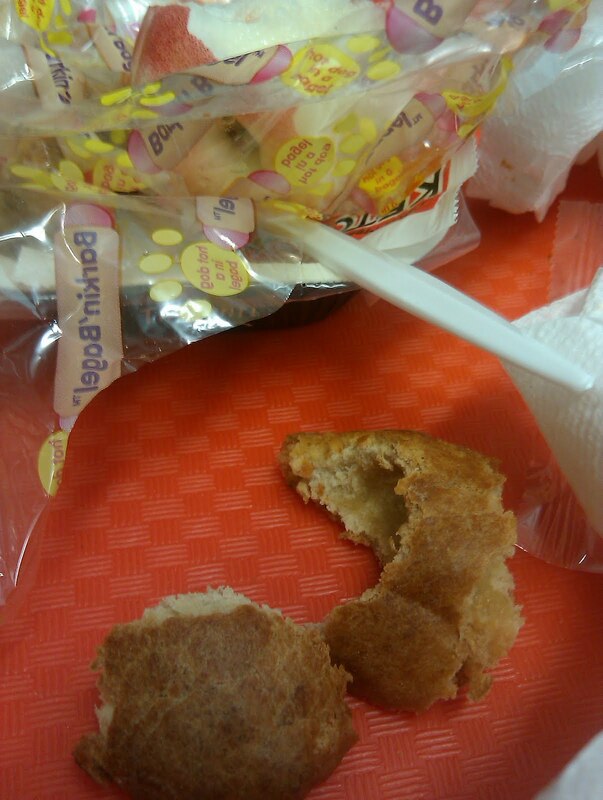 We had bagel dogs today too. The plus at your school is that you apparently have plastic reusable trays. We have landfill filling styrofoam ones. We attempt to recycle them. I don't think my kids were given a choice of veggie today, I went down with them to pick up their lunch and take it back to our room. They had apple rice cake "chips" that maybe was some sort of fruit/starch combo? The school where I work will be transistioning to trays, reusable cups and flatware next school year. We currently use a compostable paper plate and a plastic spork. I figured this out a few months ago and I can't remember if this is just the cost of the plate or the plate and the spork. $105 x 165 days= $17,325 per year in the trash. If it was shiny and smooth, it was a nectarine. If it was fuzzy, it was a peach. It looks more like a nectarine in the photo, but maybe it was fuzzy? Those tater tots look frozen! I loved it! Keep up the great work. I really enjoy what you write. You know, I've been a fan since the beginning, but now I think I love you. that is a nectarine. no fuzz and too red to be a peach. hahahaha, I love the interrogation. We affectionately refer to rib-b-que sandwiches in my house as "McSquirrel" sandwiches. Well, the kids & I do, my husband actually likes those things. Not that the bagel dog looks particularly appealing, but I'd take it over the ribwich any day! The bad cop cracked me up! You guys make me laugh! Thanks for keeping me smiling! I've been reading you since the beginning (this is only my second or third comment), but I mean… yeah, what is there to say? I understand where the commenter is coming from, but after a while, everything just speaks for itself. Brilliant! Now let's interrogate the dreaded chickie nuggets! The best part is when Mr. Rib-b-que starts crying. Yeah, that looks like a nectarine. Love reading, though! So we'll call it a nectarine then. As I said on twitter, I think of nectarines normally being very juicy. This one was not juicy. It was crunchy. Actually, I think it was rather clever of you to stimulate this much discussion and even a fair amount of media attention with this relatively simple, largely pictorial blog, Mrs. Q. It's a good example of less is more. Yes, you could have chosen a more hard-hitting approach, but in my experience this tends to alienate people who haven't been thinking too much about this subject. Yet. That looks just like a nectarine that has been prematurely ripened using chemicals. No fuzz = nectarine. Crunchy nectarine = not quite ripe. You've certainly brought to light the state of school lunches not only by eating it, but by taking pictures, blogging, AND having experts on all things food, nutrition, and some of the major players in the movement. You've done it with elegance and humor. You are obviously a teacher that looks at the whole child, not just the academic part of the child. You should be proud. What you are doing is amazing!- keep on writing and taking photos, please! I agree: A picture says a thousand words. And when you post a picture of a plastic pizza with greasy cheese substitute, or a half eaten peanut butter and jelly thing (I hesitate to call it a sandwich…or anything edible for that matter), that says more than a thousand "hard hitting" critiques in my opinion. I was literally JUST thinking yesterday "well, at least she hasn't had to eat a bagel dog for quite some time now… maybe things are starting to change…"
I've been lurking around your blog for ages now, and while I normally stay quiet, I must admit that do rather enjoy your wit. You are sarcastic without being mean, a trait that is not wide-spread on the internet, sadly. I grew up in the northwest, in a small community with no more than 60 to 80 or so kids per each grade. Our elementary school was quite small, and most of the kids in all of the classes knew one another growing up. Coming from a smaller community, however, seemed to serve us a little better in the lunch department. 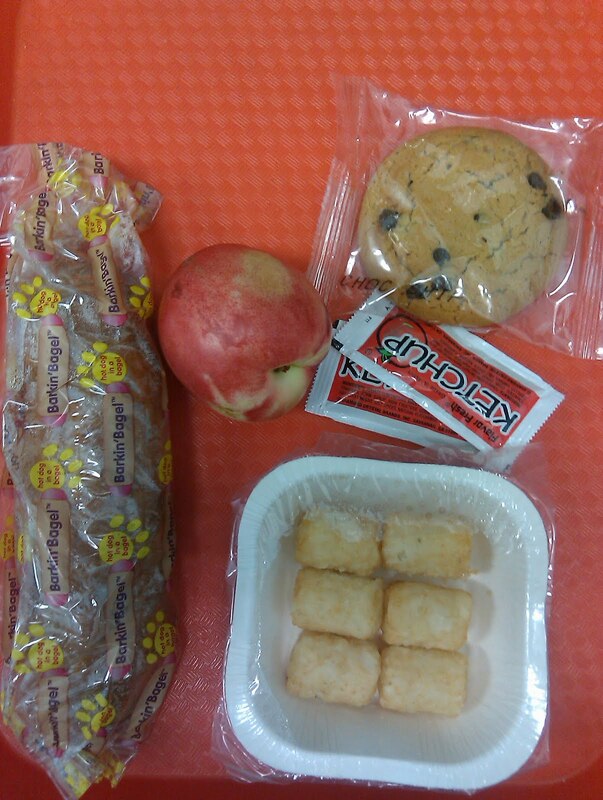 While I never recall any of our lunches being quite up to par with the health standards I have now, I do remember my lunches while growing up being far more appetizing than the stuff your students, and your poor stomach, have to endure. Some of the veggies you snap photos of make me shudder. As an adult I don't believe I'd touch them, so I can hardly ponder what your students might think of them. Heck, half the supposed 'meals' I wouldn't myself touch. You're a braver woman than I, let it be said. I'm happy you're sticking to this. Even though you're stressed out, you should feel a great sense of pride- what you're doing can change the way kids eat, can change how they eat, and can eventually change how they think about healthier food. It might not be today, and it might not be a year from now, but your blog has been gaining momentum and I believe it's only a matter of time before someone in a seat of power reads what you've done here and decides to do something about it. This blog is most definitely a push in the right direction. If only most steps would be taken to fix it all! Good luck out there, Mrs. Q.
peaches are fuzzy and nectarines are smooth! Your lunch today looks a LITTLE better than usual…I guess. 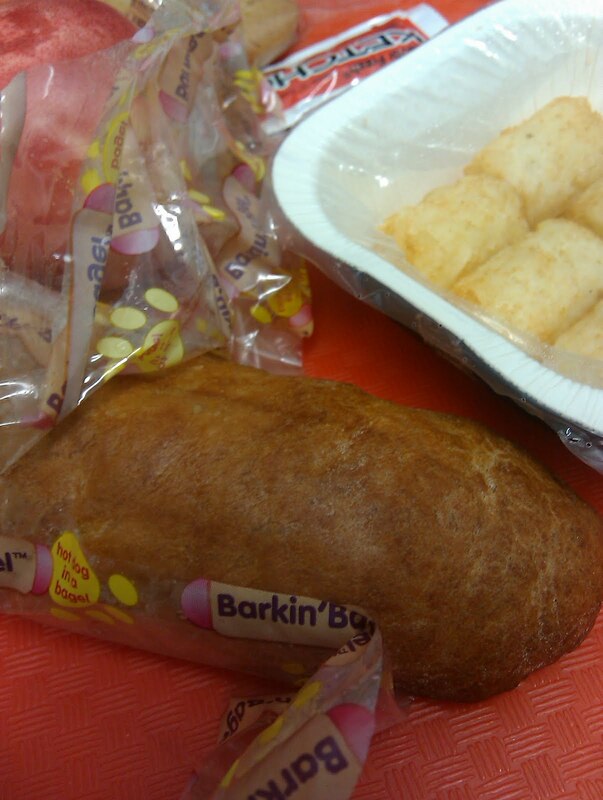 Oh yeah, in case you're wondering, I'm an Asian 6th grader and my lunch today was fish rolls. i assume that you don't rip the nutritional value of each meal to shreds because you have some feeling for the people who serve you those meals – that comes through in your posts. the entirety of your experience and the sum total of all your posts with the photos tells the story. you don't need to dress it up. PBJ – I think your figures are off. Here's an example of 500 trays for $69.05. That's about 14 cents a tray. I doubt the spork costs that much more. Your point is still valid though. lol – Mrs Q, I think eating all that odd, chemically-based food has finally started to push you 'round the bend! I couldn't help but laugh as your "Lunch and Order" scene! the interrogation was too funny. and i'm sorry, but every time i see a bagel dog, i think of the movie "role models", which made the fact that this was served to kids even more disgusting to me. You are doing a fantastic job Mrs. Q! Blogging can be a chore especially when you have pressure to perform every day. This is off topic, way off topic, and I appologize in advance. I am a school nurse. We have an amazing school garden. (I tried to email pictures to you last week, but it was too much data and I became frustrated.) Last week we had lettuce and radishes from our garden. Today, we are going to have "salad" from the garden again. I will try again to get those pictures off to you. Does the wrapper on that bagel dog say "barkin' bagel"? I'm not sure that food should be labeled with animal noises, it just brings to mind too many scary thoughts about ingredients. It was crunchy? Maybe it was an apple –that's what the picture looks like 🙂 Or maybe it was some new combination fruit? I just cut up a nectarine for my daughter's breakfast this morning, and it was definitely not crunchy! First off I'd like to join the others in saying I enjoyed your little vignette. As far as the economy of trash vs. washing you need to look at all the costs. 1 dishwasher getting paid minimum wage for 4hr/day during the school year will bring home around $4800/year. On top of that you have payroll taxes and other employment costs that depend on your location and what kind of union agreements would apply. You then need to factor in utility and soap costs. Then there's the opportunity costs of all the trays and dishes (it'll be somewhere in the $5-10 range per student). It all depends on where you are, since employment costs for the dishwashers will be the largest expense, but it may be more cost effective to throw away cheap packaging. Your posts are hilarious and are the awful truth of how the public school system decides to feed it's children (similar to shoving slop down an animals throat). I applaud you for shining light on what most people either ignore or are ignorant of. Thankfully it's people like you that will help change this problem in society. I have to agree with a previous poster….I thought it was a really crappy looking apple when I saw the photo. I forgot to comment (further above) on the fact that I'm not really a big fan of "after meal" photos with all the trash showing!! Yes it does emphasize how much waste one meal can produce, but I find it unappetizing and it might turn me away from looking at any new post photos! But maybe that's just me- maybe it doesn't bother anyone else…For me the lunch as it is speaks for itself! Love the RibQ smack down and todays lunch looked less appetizing but portions seemed right. I loved the 'Lunch and Order' scene! Have you considered how the 'tots always seem to hang out in 'gangs' and are of the same size and shade? I've been lurking for weeks but thought I should comment just to let you know I literally LedOL (laughed out loud?) at the interrogation. I think you're doing an amazing job on this blog considering that you have a very full life apart from it. Thanks for caring about something beyond your own and your family's welfare and health. "Of course there is a significant expense upfront, but doesn't that dollar-cost-average out?" Probably. I work in a commercial kitchen. I averaged the cost out to a per plate average of 0.3 cents per plate to wash in a commercial washing machine (including labor). Most likely the packaging costs up to 10x more. Of course no school would see that as a separate cost because it is bundled in with the cost of the entrée. The school only sees the cost of the labor for the dishwasher, which they would have to eat (no pun intended) compared to not with pre-packaged.